This Christmas I had the joy of making a pilgrimage to the Tyburn Convent in London together with an English spiritual theologian David Torkington. He took me to this convent of contemplative nuns who keep vigil together at the sight of heroic witness to the Catholic Faith. The Benedictine Adorers of the Sacred Heart of Jesus of Montmartre are there to intercede perpetually for the whole world, all of humanity -- for its reconciliation, healing and peace. Throughout the day, the nuns offer a tour and presentations of the Shrine of the English Martyrs over which they keep watch. While there were many powerful stories shared during my time with them, the story of the Carthusian martyrs was particularly poignant. Earlier in the day, Dom John Houghton and his Carthusian brothers together with a diocesan priest were marched in their vestments from the tower of London to the Tyburn. They were partially hung and mutilated before their death. After this public torture and exhibition, the executioners cut out their hearts to kill them. John Houghton was first. When his heart was cut out, they placed it in his hands. He is reported to have offered it to God with his dying words, "Lord, what wilt thou do with my heart?" The context of this execution is striking. When Henry VIII had asked the Carthusians to support his succession as "Head of the Church," the hermits took this request to prayer. At this time, doctrines concerning the Chair of Peter were not as clear as they are today. We can guess that they had wanted to be good subjects to the King. We can also guess that they did not want to cut themselves off from communion with the universal Church. Finally, we can also surmise that they had some sense that defying their King would have disastrous consequences. They needed to sanctify this ambiguity by discovering the most appropriate means of serving God in the midst of it. So they offered the Mass of the Holy Spirit. During Mass, through the Eucharistic prayer and the descent of the Holy Spirit, the priest consecrates the offering of bread and wine with his own hands and the power of the Holy Spirit. By this action, the bread and wine are earthly bread and wine no more, but become the Body and Blood of Christ - his real presence on earth, heavenly food. In this way, the hands of a priest allow the whole Church to offer through his ministry the Body and Blood, Soul and Divinity of Jesus Christ in a very real and powerful way. Through this offering, we pray for everything and everybody -- our enemies and persecutors, our neighbors and loved ones, the stranger and the destitute. Not as a nice wish or some vague aspiration, but with confident certitude and firmness of purpose, this spiritual worship allows us to stand before God and know that we are heard. When His whole mystery is offered to the Father for His glory and for the salvation of the world, something from Above breaks into even the most difficult circumstances here below - light shines in the darkness, and the darkness cannot overcome it. At this moment of the Mass, the Carthusian heard the singing of heavenly choirs - angels songs were calling to them. This canticle echoing from heaven called to them and they could not be indifferent. Love from heaven above evoked love from their very depths. Their hearts were pierced with clarity, conviction and confidence. The confusion that they suffered before Mass was dispensed. The inner voice of conscience had spoken in harmony with the music from above. In holy freedom, for their own integrity and dignity as sons of God, they knew what they had to do, even at the price of their own blood because of the Blood that was shed for them. When Saint John Houghton held his heart in his priestly hands, his executioners might not have understood the sanctifying power of his priestly question, but the glory given to the Father at the Mass was extended into that very moment. The integrity of worship and faith and witness were being held up in the midst of painful obscurity in the frail hands of a dying contemplative and priest. 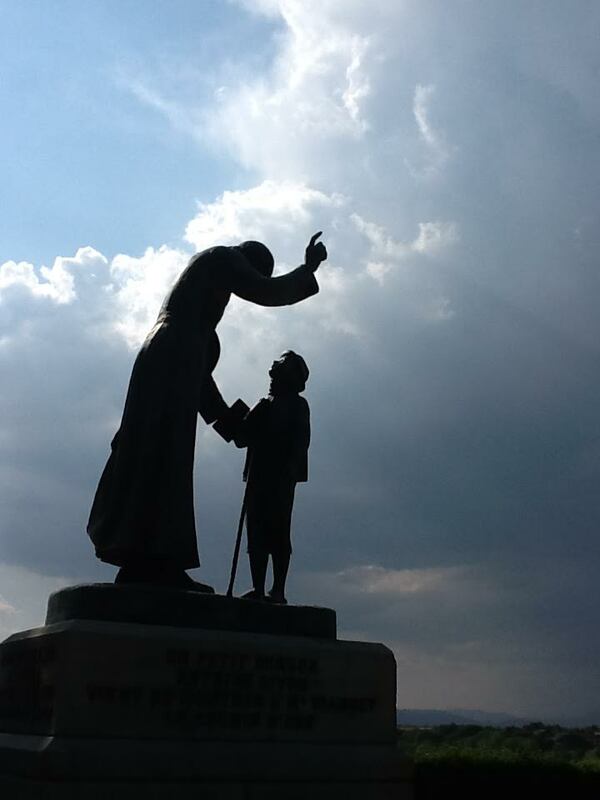 This gesture did not make the evil of that day magically go away, instead the powerful here below were confronted with a wisdom from above -- and at the Tyburn Convent, this wisdom of loved offered for the sake of men, their integrity, and their faith remains unvanquished. 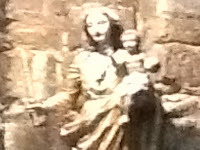 Mary sees in the face of her child the tears of God and the joy of humanity. Hungrily having clung with unquenchable thirst to her breast in our cold darkness, in every challenge she sees Him ready to teach us how to cling to Him in faith. He at once envelops us in the abyss of his love when we see how He allowed her to wrap Him in swaddling clothes. At home with the poor and all those for whom there is no room in society, she ponders how He leads us to our true home in the bosom of the Trinity. She has always welcomed these unfamiliar gifts with awe, adoration, and selfless acts of mercy. Her example lights the way for us to discover how to rejoice in these troubled times. When we consider the arms of the Virgin Mother carefully holding the Savior, we behold how our own hospitality to Him must include complete acceptance of His power to deliver us from sin and death. As she rejoiced to be redeemed by His blood in a singular way, each of us must learn to humbly lay before Him the burden of guilt that He has come to take away so that we might rejoice as well. Confessing our sins with holy sorrow and rendering to Him an act of thanksgiving, we too hold Him in our own arms. Lifting up our hearts with prayers that are right and just, we too learn to listen to his vulnerable cry. If we will look into his eyes, we will see that, with great joy and eagerness, He has come in poverty, like a beggar. He hopes that we might let go of our pain and trust Him with it. He wants us to be completely free to love -- and He does not want us to torment ourselves over failure and inadequacy. He yearns to be welcomed and held with confidence in love and for love. His arms remain as outstretched to us this Christmas as they were to Mary that first Christmas, and the joy she knew through her devotion to Him could be ours - by this simple movement of trust, the choice to respond to His tender presence. In Mary we know that the God who weeps as a baby is discovered by the heart who says "yes" to this gift of divine joy. This peculiar paradox is an encounter of suffering humanity against divine humility, the doom of death against the surprise of life ever-lasting, the limits of human evil against limitlessness of God's goodness, of earthly poverty against heavenly riches, of ignorance of men against the foolishness of God, of deserved condemnation against incalculable forgiveness, of darkness against the Light, of the Word against silence, of human emptiness against divine fullness. Because Mary pondered all these things, we know that the conflict of these extremes is only resolved by an adoration of the heart, a loving acceptance the mystery of the Word become flesh dwelling among us.This simple movement, this humble contemplation, this willingness to be inconvenienced by God who smiles at us in our neighbor, makes us like her vulnerable to angels' voices, and heavenly signs, and shepherds' wonder, and the homage of wisemen. Like the magic of dew fall in the morning, the life of Christ is invisible to the world, an impenetrable secret to anyone whose concerns are limited to the here and now. At the same time and without fully being aware of it, everything that is below, visible and part of this physical world is waiting for what comes from above, what is invisible and spiritual. Into this expectation, the Father speaks His Word and the Word became flesh and made His dwelling among us. Because of this secret presence, Saint Paul teaches those who believe, “Your life is hidden with Christ in God” (Col 3:3). This truth of the faith is not simply about the physical location of Christ -- for the Risen Lord has gained access to the whole of our human reality. For Christ to dwell with us especially means that the world here below has been filled with heavenly realities. The emptiness of our lives yields to the fullness and new meaning He brings to everything. Hidden in the mystery of faith, Christ realizes all the noble aspirations of the creatures with whom He has chosen to make his home. He is not put off by our hardships but enters into our homelessness. Born in into a immigrant family, He is in solidarity with the strangers in our midst. Cloaking Himself in poverty, He is not put off by our rejection but remains present, inviting us to change our hearts. He is not put off by the humble and marginalized, but sends them heavenly messengers of His presence. Most of all, He does not fear our aggression or hostility, but comes in great humility and gentleness to rescue us from these things and to restore our dignity. This embrace between Heaven and Earth that He extends to us is not an abstract idea, but a living reality, personally present, in a transforming way. Every Advent allows us to welcome and marvel over this wonderful gift again. There is, however, a price: those who begin to live hidden in this mystery will certainly be misunderstood by those who do not share this life. Even more, people of prayer will be confounded by their own failures and mediocrity in the face of such divine love. We must never be discouraged by our own difference and lack of mercy. Instead, each of these trials is another occasion to learn to have confidence in the One who has come and is coming for us anew. Even as the hostility of this world exhausts itself against the love of God, prayer discovers how inexhaustible God's love is. For those who go on this pilgrimage of prayer with the Lord who comes, they come to yearn for the secret glory that He yearns to share. Without knowing how, the dew of Christ's coming permeates their own life -- and, in everything, they rejoice in His victory and Lordship. but the very manifestation of ultimate reality — indeed the very source and end of all that is. and today, as then, the human heart can welcome Him and become a divine dwelling. in the astonishing excessiveness of divine love. Advent Prayer is forged in the darkness of this world's injustice, hatred and cold disregard. It is not a convenient or comfortable offering. It is crucified and bound to those who need a word of hope. To be truly Christian, this prayer must suffer all kinds of difficulties and face seemingly insurmountable challenges with generous readiness. This cry of faith must not allow itself to be overcome by distress or anxiety, but instead patiently endure all kinds of sorrow with trust. The more love such prayer costs, the more love it brings -- but it has the power to find love where there is no love, because it puts love there. Even when no more than a gentle invocation of the Name of the Lord, its gentle persistence is not crushed down even by the most coercive hostility. When exhaustion and shock leave one with no words to say or spiritual feelings at all, this hidden act of piety remains a beacon of human dignity in determined silence -- an offering in hope that does not disappoint. This humble prayer stands on what is faithful and true. It finds invincible confidence in the face of heartrending disappointment and unbearable grievances. By believing in the coming of the love of God, even more than the malice and apathy of men, this simple movement of heart remains on firm ground, the only ground that can bear the weight of human existence. Such love consumed prayer can hear Divine Whispers above even the oppressive rancor of cold contempt. The unfamiliar light that this contemplation knows can open up a sanctifying gaze deep into every terrifying shadow of our culture. It makes straight a pathway through confusion. It levels mountains of doubt and despair. It sings with a joyful praise that can still even the clamor of the public square. It always rejoices to welcome the quiet fullness of the Word even in the midst of tears. When it is fully mature, this cry of recognition and love echoes forth from such depths that not even death can silence it forever. If we desire our Advent Prayer, in the end, there are no tricks to teach, no shortcuts to take. In the cold hard path where we stumble on our neighbor broken in the dirt of daily life, this prayer begins when we surrender our own plans and appeal to the mercy of God with humble trust. When this happens, when our Advent Prayer takes on the proportions of real love, something worthy of the One crucified by love is born in us and we have begun at last to prepare for His coming.